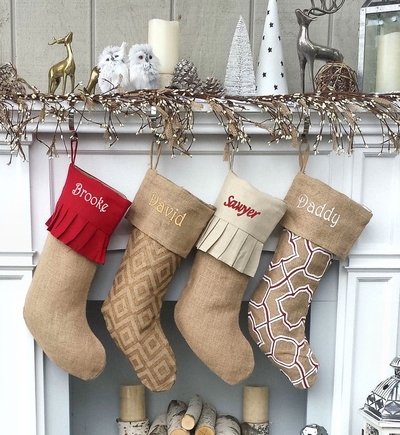 Personalized Elegant Burlap Christmas Stockings this Collection Features Modern Moroccan or Diamond Prints, Or Linen Ruffle Cuffs or Linen Red Cuff for the Perfect Country Chic Rustic Sheek Look for your Decor. Personalized Embroidered free of Charge. The Price is per stocking - ONE STOCKING - we have photographed a group together so you can envision what they look like when you decorate with them as a group. Stocking measurements : please refer to the detailed description lower on this page for each design. 1) Design1 : Burlap Boot with Red Pleated Ruffle Cuff - Measures about 19-20" inches diagonally from the top left corner where the hanger attaches diagonally across to the toe of the stocking. The Stocking is about 8" wide at the top. It is lined inside with cotton. This is the one pictured with the Name Brooke in Christmas Block Font. 2) Design2: Burlap Boot with Moroccan White and Red Overprint and Burlap Cuff - Measures about 19-20" inches diagonally from the top left corner where the hanger attaches diagonally across to the toe of the stocking. The Stocking is about 8" wide at the top but the boot of the stocking is narrower than most, you can see it in the pictures. It is not lined inside. This is the one pictured with the Name Daddy in Christmas Block Font and White Thread. 3) Design3: Burlap Boot with Diamond Gold Tone Antique Overprint and Burlap Cuff - Measures about 19-20" inches diagonally from the top left corner where the hanger attaches diagonally across to the toe of the stocking. The Stocking is about 8" wide at the top but the boot of the stocking is narrower than most, you can see it in the pictures. It is not lined inside. This is the one pictured with the Name David in Christmas Block Font and Metallic Gold Thread. 4) Design4: Burlap Boot with Off White Linen Pleated Ruffle Cuff - Measures about 19-20" inches diagonally from the top left corner where the hanger attaches diagonally across to the toe of the stocking. The Stocking is about 8" wide at the top. It is lined inside with cotton. This is the one pictured with the Name Sawyer in Christmas Hand Font Red thread color.